Exterior of swimsuit is pristine. 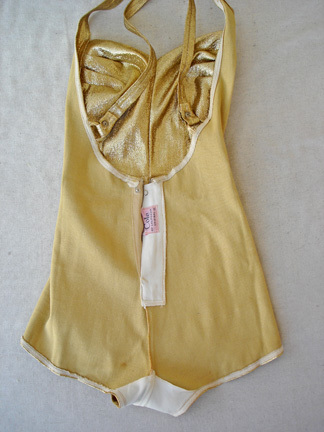 The interior of the swimsuit has a few minor spots and a minor tear. There is one light 1/4" rust blemish on front lower bottom panel. 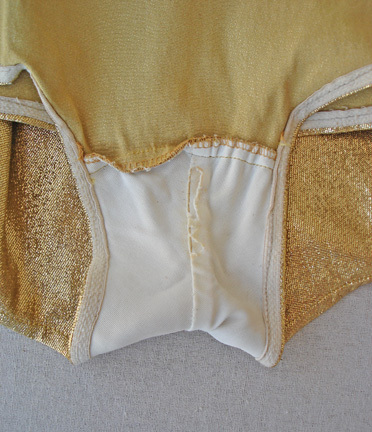 There is a 2" vertical tear at crotch seam, with some very minor rust staining, which can easily be repaired. On back of swimsuit, very close to elasticized leg band, is one reddish brown spot (probably rust), approx 1/8" x 1/8". I see a very tiny speck at right hip, and on the back, near seat, a brownish spot - both not even noticeable in photograph. Swimsuit is clean. Elastic is strong, swimsuit is not stretched out in any way. 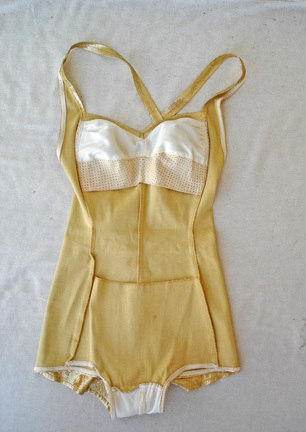 This is a rare swimsuit that I am very familiar with and, considering it is over 60 years old, I will state that it is in excellent condition.